The argument you hear is that the creative world is so much more complicated today than it was at the Bauhaus in the 1920s. It is harder to join one area to another. It takes so long now to master the intricacies of graphic design that it is well nigh impossible to move into film, or exhibition design. Sometime a designer makes a film, or a product designer designs a building, but two disciplines is it. And we consider this a miracle. If this is true, then we are all destined to remain pygmies. Well, not all of us. It is hard to sum up Massimo and Lella Vignelli. He is essentially a graphic designer, and she an interior designer, but by enhancing their powers in a personal and professional pairing, the Vignellis have spent a 50-year career designing almost everything there is to design. The exact nature of their partnership is hard to fathom. You can’t really tell, and they won’t say, who designs what. Which is surely part of the point – we have all worked in creative teams where the origin of an idea is shared; sometimes it comes from an assistant or even the client. By joining their names, the Vignellis show that even before a project has begun, they are a team. And it’s not as if the Vignellis have simply been content to feather their own nest. They care about the quality of design discourse, education and ethics. Massimo edited and designed Zero, a magazine exploring design issues some decades before anything similar appeared. In part it is the undeniable dignity and durability of their work has given them influence, but Massimo in particular has always been very vocal about what makes good design good. He fought a very noble campaign – and got called all sorts of dreadful names – in the pages of design magazines during the 1990s. It is clearer now with a little distance to see whose argument had more weight. While advocates of trendy typography – who were busy designing a self-funded leaflet or maybe a poster that would never be printed – poured scorn on Massimo’s apparent rigidity, he was being asked to design the identity and literature system for the cutting-edge future-thinking worldwide Guggenheim Museum. An American critic wrote: ‘In many ways, the Vignellis are considered to have given graphic design its stature in contemporary society.’ A giant claim for two Bauhaus-style giants. Massimo Vignelli portrait first published in Eye 83. Photograph: Maria Spann. 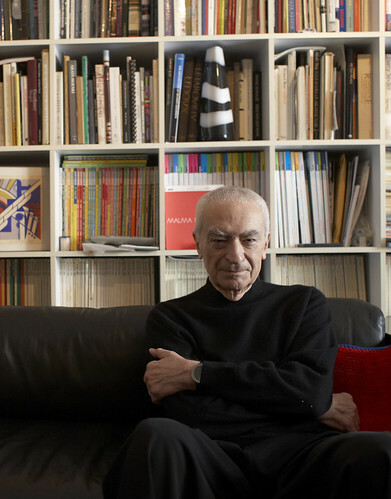 See R. Roger Remington’s Reputations interview with Massimo Vignelli in Eye no. 83 vol. 21, 2012. Quentin Newark is a principal of Atelier Works, London.